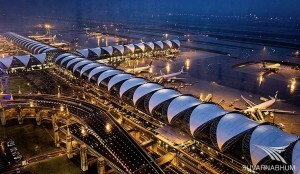 Suvarnabhumi International Airport is preparing measures to accommodate up to 173,000 travelers per day during the tourist high season. Airport Director Sirote Duangratana revealed that between October 30th, this year and March 25th, 2017, the country will enter its usual tourist high season. An average of 965 flights are expected each day, a 9.52-percent increase from the same period last year. That translates to 173,000 passengers per day, or a 26.4-percent increase from the same period last year. During this time, Russian airlines Nordwind Airlines, Rossiya Airlines, and Vim Airlines will convert their airplanes to charter flights. New arrivals to the airport include Lucky Air from China, flydubai from the UAE, and US-Bangla Airlines from Bangladesh. However, Delta Airlines and Raya Airways from Malaysia have suspended their flights into Suvarnabhumi Airport during this period. Mr Sirote said the Suvarnabhumi Airport will provide access to transportation from the airport in the form of an organized taxi service, car rentals, limousine services, public buses, as well as the Airport Rail Link. Travelers will also be given the option to use the Common Use Self Service for self check-ins for 15 airlines. For THAI Airways, people who used the self check-in service will be able to load their luggage using the Common Use Bag Drop service. As for parking lots, the airport’s No. 1-4 parking structures will be ready to accommodate 6,000 cars in addition to 450 parking spots at the nearby Novotel Suvarnabhumi. Long-term parking services will also be available for 2,154 cars and 700 motorcycles. In his closing remarks, Mr Sirote affirmed that security officials will be deployed at the airport at a coordinating center, while guards will be stationed throughout the airport 24-hours per day.